BTW - what was the result of the strap discussion?? OK, let me try again - which strap did you decide on for this watch? I'm finding myself wishing for silver hands rather than white, but we can't have everything now can we? Yes, there's a richness to it. No 'England' on the dial Eddie? Who knows? Anything at this stage will be a guess. Any chance you will be selling extra straps for those of us that are wrist challenged and will have to trim it? I've ordered a shed load of rubber straps only yesterday. 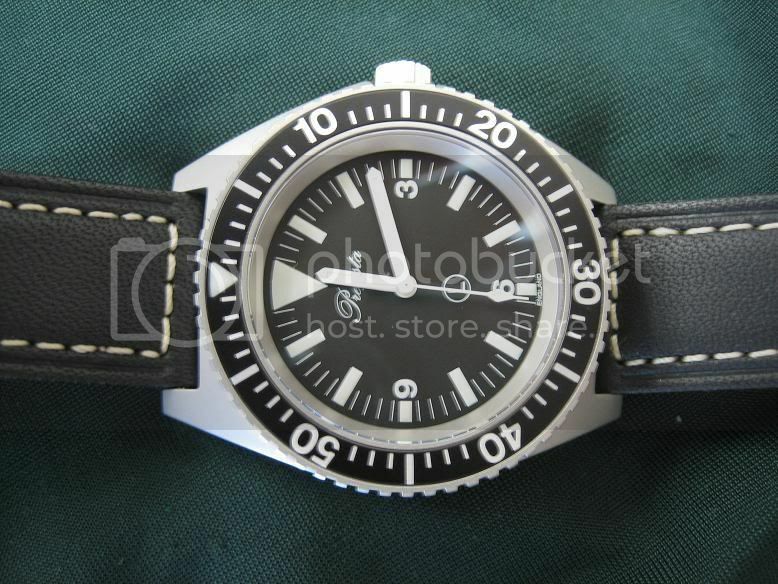 and how does it fit in with the rest of the dial [which looks more classic].. There is some historic importance. That's the reason for the no rad symbol. A (excited): Look mate, I got a new watch! B (lifts his eyebrows): Oh. But it doesn't have that.. err.. you know No Radiations on it, eh? A (confused): No Radiations? What? B leaves. A leaves (totally shattered). It is a homage to the Blancpain Fifty Fathoms, one variant of which had that 'no radiations' dial. The 'no radiations' refers to the fact that radium was not used for the dial lume, so meeting some military and commercial specs at the time (mid 1950s). Not sure if Tritium lume was specifically excluded too? 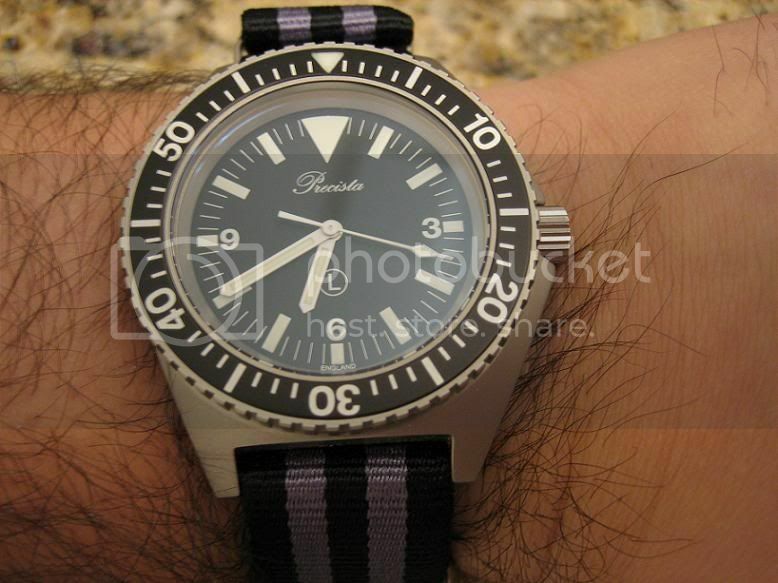 On the Precista version, it is purely decorative of course as it would have superluminova anyway. Tritium is radioactive. Just like Radium. On eBay it would just say "No Guarantee"
Eddie, please give my place in the reservation list (#46) to someone else (from the waiting list). I find my interest shifting to aviation watches. It goes to Mr Barron from Canada if he still wants it. YEE HAW!!!! I MADE IT INTO THE 50!!!!! Sign me up Eddie, # 46 is coming up north!!! P.S. is this thing gonna be snow proof??? I know is vulgar but would anyone care to suggest the upper and lower bounds of the price of this one. I've another purchase in mind and am holding on in case it is significantly more than that. I'm guessing something similar: less than the 14 (lack of anti-mag, lower WR), but more than the 17/18. At the moment, I don't think even Eddie knows. The sapphire crystal will add to the price as well. I have been figuring a price of 400 pounds... at least that is the number I have been quoting to my wife. I wonder if Fricker will charge for storage of the assorted parts while they farted around for months? My reasoning was that O&W charge a premium of £30 for the ETA over the AS and the crystal is thick but not particularly unusual apart from that. I'm prepared to pay the price but would have to think about it if it was significantly over £400.